Visual artists include DEAN HASPIEL (an Emmy-award winning animator, and creator of the Eisner Award-nominated Billy Dogma) and PETER SCHMIDEG (offering the world premiere of his animated Walt Whitman poem). Dramatists include JOHN FARRELL (founding member of NYC’s legendary Everyman Company and author/star of Off-Broadway show Walt Whitman: Time Traveler), along with PAUL DeRIENZO (detailing his “War Against the War on Drugs”). And wrapping up the show will be the hilarious sketch comedy duo BLEACH & BONG, along with stand-up comic, political activist and 2013 NYC mayoral candidate RANDY CREDICO. 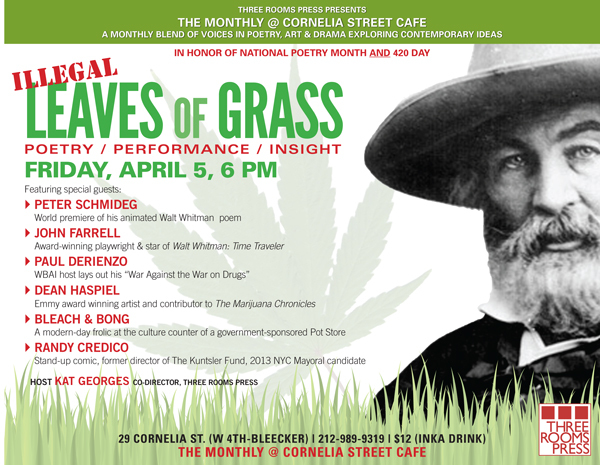 The event will include giveaways of Illegal Leaves of Grass-related dvds, books and other prizes! Doors open at 5:45. Admission is $12, which includes a free drink. Cornelia Street Cafe is at 29 Cornelia Street, in the West Village, between W. 4th Street at Bleecker (http://corneliastreecafe.com). Reservations and additional information: info@threeroomspress.com. Illegal Leaves of Grass of is the latest installment of The Monthly at Cornelia Street Cafe, a unique series curated by Three Rooms Press that brings together leading poets, intellectuals, performers and budding rebels on a different topic each month. Upcoming events include: APRIL 12: GIMME SHELTERS (all-open poetry reading—to account for yourself!! Special $8 cover charge); MAY 3: HAVE A NYC 2 (readings of New York-based short stories! Special $8 cover charge); JUNE 7: HYDROGEN JUKEBOX (modern poetry performed to live rock band).